Mental bloviations on the world as seen through the eyes of a pathological neuroscientist. This is part six of our multi-day series on The Zombie Brain. Be sure to visit Oscillatory Thoughts tomorrow for symptom 7! Cut off an arm, yet they keep coming. Shoot them in the chest, they keep coming. Light them on fire, they keep coming. 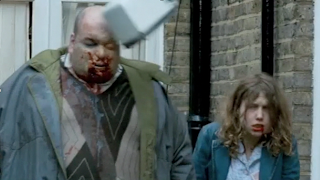 How does the zombie continue to chase us despite wounds that would cause debilitating pain in a normal person? It's quite simple really. They’re not aware of the damage done to them. More specifically, they may not be feeling the damage being done. That toaster's going to leave a mark! Scientifically we call the sensation of painful stimuli nociception. * The physiological systems that regulate our experience of pain are incredibly complex. So I'm going to give you the short and simple version. Receptors in the skin pick up mechanical, thermal or chemical changes relay this information to neurons in the spine. This information goes up the spine through a few different different routes and gets relayed to several cortical regions. The combined recruitment of these neocortical regions then gives rise that "Ouch! F#$% that hurt!" response. A majority of these pain signals are processed in a forward part of the parietal cortex, known as the somatosensory cortex. These area sits right behind the region of the brain that consciously controls movements. Now the somatosensory cortex actually regulates our experience of all physical sensations (touch, vibrations, etc.) and processes most of the conscious signals that we are aware of feeling. 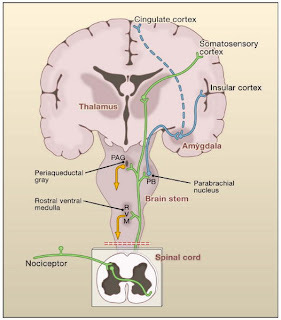 However, this area is actually made up of two distinct areas : the primary and secondary somatosensory cortices. Each regulates the processing of different types of sensory information. There is also a second pain pathway that regulates our rapid unconscious experiences of pain. Most of this engages the inappropriately named "fight-or-flight" circuit via the amygdala. Signals are relayed to a few separate areas such as the cingulate (that processes conflict) and the insula (that, well appears to do everything). It is thought that these areas regulate the emotional salience of pain. Now let's think about this... when was the last time you saw a zombie get emotional about anything let alone a little thing like having a limb chopped off? This suggests that this second pain pathway is disrupted in the zombie brain. It’s also clear that zombies can still move and they have an idea of basic sensations (they know where their own bodies are, and they do react reflexively to stimuli), but they don’t appear to have conscious awareness of pain and other sensations. This gives us good reason to believe that the nerves that sense pain, pressure, and so on in the body are intact, because zombies do still react to stimuli. We also know that the spinal cord that transmits those sensations up to the brain (and movement signals down from it) must also be intact. Furthermore, before touch senses get to the brain, they stop in the brainstem where they can be mediated and controlled before entering “conscious” perception. Thus, we believe that there are a couple of vectors for the zombie’s immunity to pain. 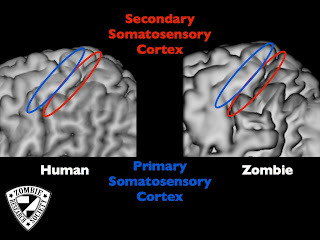 First, their secondary somatosensory regions in the parietal cortices are impaired. This would minimize experiencing some types of painful sensations, but not all. 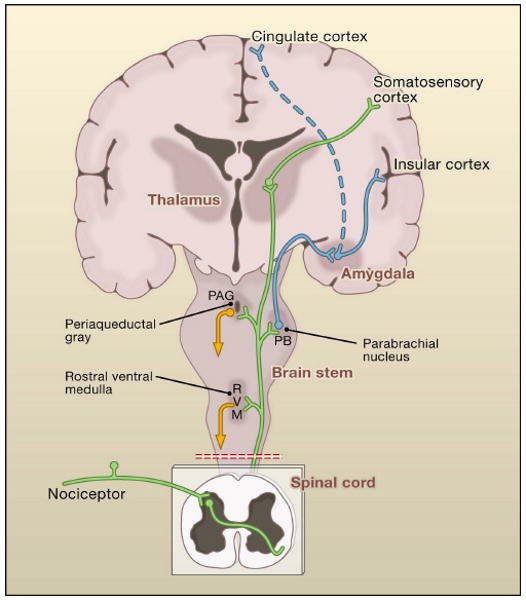 Note that the primary somatosensory cortex (regulating fine touch, sense of limbs, etc.) is still intact. 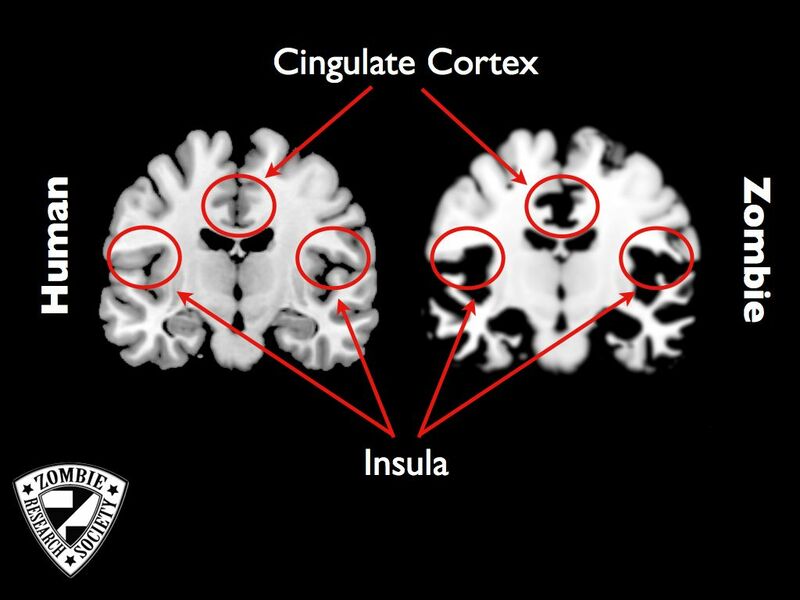 More importantly, neocortical regions like the insula and cingulate should also be obliterated in the zombie brain. This would eliminate any emotional reactions to the residual painful stimuli processed in the somatosensory cortex. Thus zombies may actually feel pain and really just not give a crap about it. Just like Chuck Norris. There you have it folks. A numb, cold-hearted creature incapable of feeling pain (please save the lawyer jokes for another forum). * Contrary to popular belief, we don't have just 5 senses. We probably have closer to 20, and most of them involve different types of physical senses. There's a sense for feeling your limbs in space (proprioception). There's a sense of fine touch and vibrations called epicritic touch. There's the feeling of heat, sharp pain, etc. Help still your mind and soul with my well crafted cd on Meditation. Now one for the men and women who have served us." Our clinic promotes the stabilization of spinal function and improved quality of life for individuals suffering from acute and chronic pain. Murrieta Pain Relief Center offers various and multiple pain relieving therapies including chiropractic care, lumbar spinal decompression, and neuropathy therapies. Back pain can be caused by many different diseases and conditions. Some of these conditions can be very serious but fortunately, they are for the most part uncommon. These serious conditions include; cancer, tumors, neoplasm, inflammatory arthritis, and infection. New Voytek Lab paper by Richard Gao!